Sometimes the best kids’ art activities aren’t planned. Take this Valentine’s Day project – it (like similar activities we’ve done before), wasn’t something that I set out to do. After cutting out hearts for a holiday garland I took a look at the scrap paper that was left over. And, what did I see? A nice little negative space activity that was left behind. This wasn’t the first time that I’ve done one of these art projects. Many years ago I was a new art teacher. I had a week-long summer art camp for 4- and 5-year-olds at the local museum. An hour into my two-and-a-half hour day, I had finished my lesson plan. Left with an hour and a half, and 12 preschoolers who were starting to look like they were planning an art camp revolt, I pulled out the scrap bin. It was in my line of sight, and I started to see the kind of cool scraps that were left behind – after shapes, forms, globs and blobs were cut from them. So, I figured why not play with these cut-out papers. · Paper – I used card stock and construction paper, but either (or both) is fine. · Optional: Tissue paper, glitter, sequins, crayons, markers, tempera paints – you get it, right? Just about any other art materials your kids love can work into this activity. 1. Fold the paper in half. 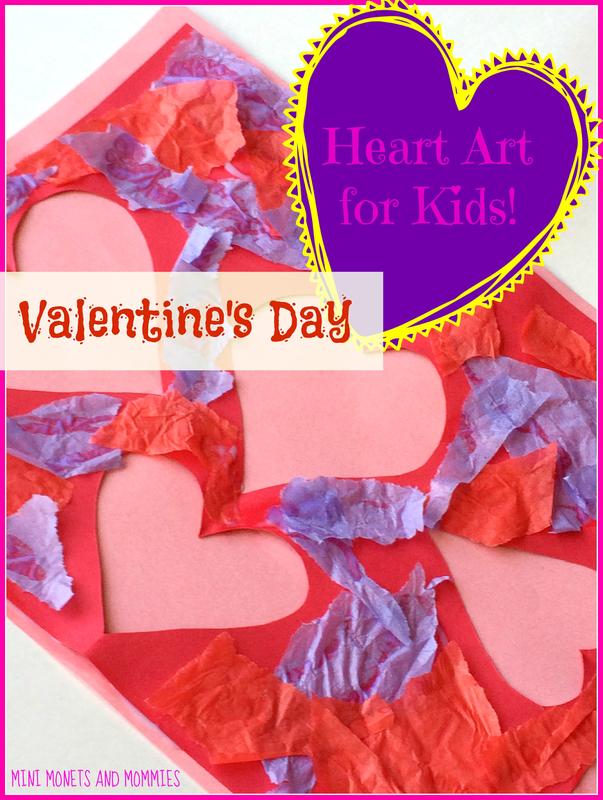 Have your child draw half of a Valentine’s Day heart on it. 2. Cut the heart out. 3. Fold the paper again, in a different direction. Repeat the drawing and cutting steps to make more ‘holes’ in it (all the folding and scissor work is great for your child's fine motor development). 4. Open the paper to reveal the missing heart shapes – that’s the negative space. 5. Glue the cut-out paper onto a piece of whole paper. Your child can use a plain sheet of paper or one that she has drawn or painted on already. 6. Optional: Decorate the paper (the parts around the hearts). Try a tissue paper collage, add glitter and sequins or paint it! Are you looking for more Valentine’s Day art? 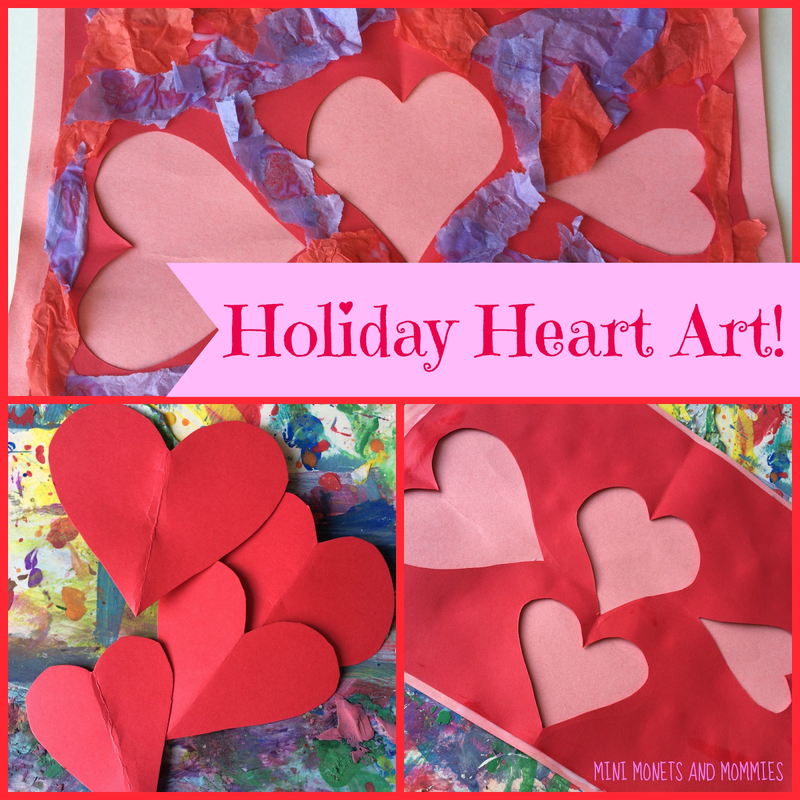 And, follow my holiday kids’ activities Pinterest board! Follow Mini Monets and Mommies's board Valentine's Day Activities for Kids on Pinterest. This is an adorable art project!